Vegan, natural strawberry flavours, easy. This is a magnificent pink wonderland cake. It's giving me major Barbie vibes! I love making swiss rolls / swirl cakes. They're so much fun to make and the end result is a 'wow factor'. Swiss rolls can seem pretty intimidating to make but once you get the hang of them...you'll be making them every weekend- haha! With its pastel pink colour, it would be perfect for Mothers day and Easter too! 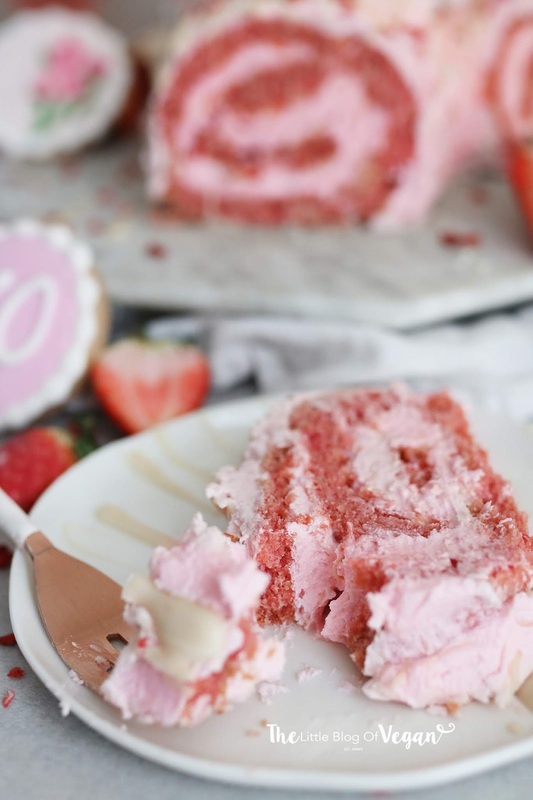 This cake would be irresistible with a glass of rosé and a cosy film. Step 1- Preheat your oven to 180 degrees c and line a large baking tray with greaseproof paper. Step 4- Add the melted coconut oil to the 'buttermilk' and whisk to combine. Step 6- Gently fold in the pink food gel until just combined. Don't over mix the batter. Sprinkle over some goji berries and ground almonds (optional). Step 4- Re-roll the sponge tightly without the paper inside. Wow, can't wait to make this!!! 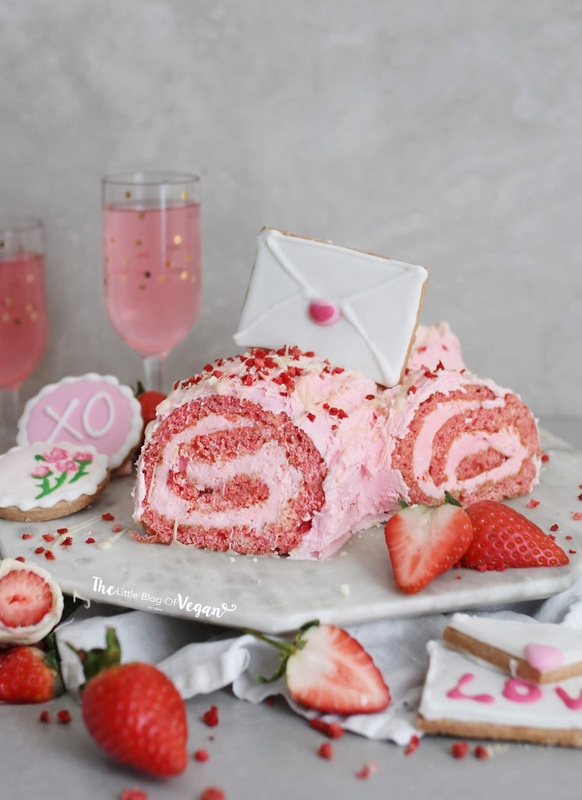 This roll is absolutely perfect for Valentine's day! 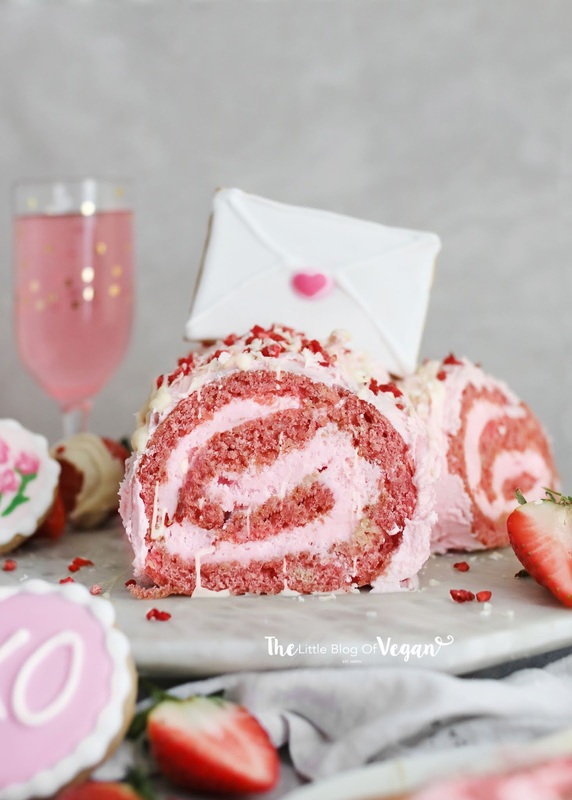 Your Strawberry and white chocolate Valentines swiss roll looks so yummy! This would be the perfect Valentines Day goodie treat. I'm not good at rolling my swiss rolls but will defiantly keep trying.